Visit the town of Erli in Liguria, Italy and enjoy walks in the Ligurian hinterland. The mountain village of Erli lies embedded in chestnut forests, olive groves and orchards. It lies on the old Via Sale (Salt Street), hence giving rise to the assumption that there was once a station there for changing horses. However, the actual origin of the village goes farther back into ancient times. 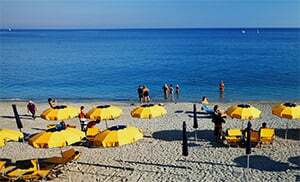 Erli lies in the hinterland of the province of Savona, which lies in the Liguria region. The numerous chestnut and mixed forests are a characteristic feature of this village. Besides, Erli lies in the Neva valley. This valley is very well-known and popular for good regional fruits like peaches, apricots and grapes, as well as different types of green vegetables. In addition, this region produces some very good Ligurian wine (the Pigato white wine). Those who prefer mingling with other people will definitely enjoy the various events organized in the village. One such popular event is the village festival called the „Chestnut Feast“, where chestnuts and mushrooms are the main focus. It takes place annually in October, in Erli or in Zuccarello. Some times you can spend a nice evening in the cozy restaurant in one of the localities, namely Berrioli oder Gazzo. The entire area around the village of Erli is a very popular hiking area due to the mountains stretching along the border, for example Monte Alpe (1056 m) or Colle San Bernardo (956 m). Besides, there is also the very beautiful hiking path called Via della Contessa, which begins from the district of Costa. From there it is not far any more up to the ski area of Garessio. If you decide to spend your autumn holiday in a holiday house in Erli, then you should absolutely venture out into the forests to look for some mushrooms. However, you have to always seek permission from the community before you can do that. The local organisation in charge of environmental protection organizes an annual hiking excursion every 1st of May, and the forests play a major role on such occasions. Erli was founded during the Roman era as an exchange point for horses along the Salt Street. It then became property of the bishops of Albenga, and in the 12th century it became property of the Marquis of Clavesana. Erli changed hands again in 1326 and became property of the Del Caretto family, and in 1397 it became part of the territory belonging to the Marquis of Zuccarello. In 1624 Erli became part of the Republic of Genoa, until in 1797 it reverted back to the Republic of Liguria, after the French occupation. Erli joined the First French Empire in 1805 and was absorbed into the Italian kingdom in 1861. From 1973 to 2011 Erli belonged to the mountain communities of Ingauna and Ponente Savona. Erli is one of the villages in the province of Savona, which lies in the Liguria region. There are several other villages near Erli, and they include: Gazzo (3.8 km), Vecersio (7.4 km) and Zuccarello (4.9 km). Branch off from the highway exit to Albenga when coming from Genoa, and then take the left turn onto the SP582. After going past Zuccarello you will then reach Erli.